My review of The Saem Love Me Multi Palette is a little late as this blush and eyeshadow palette released for Holiday 2018. When I recently asked what brands you’d like to see me feature one of the more popular replies was Korean Beauty and Makeup. I admit I’ve been remiss in this area as I typically get replies about how hard it is to buy more obscure K-Beauty brands and this was one main reason I stopped featuring them. However, I was ever so delighted people did in fact want to hear more about them which made me decide to haul out the photos I took of The Saem’s Love Me Multi Palette that I got back in December and review it today. It’s still readily available from a ton of different sellers as well including one of my favorite E-bayers, F2Plus1. Let’s take a look at the The Saem Love Me Multi Palette below because it has quickly become one of my favorite palettes. The Saem introduced the Love Me Multi Palette which features both blush and eyeshadow and another Love Me Palette which features all eyeshadows. I actually own both and they are two of my favorite palettes at the moment as they contain a nice mix of warmer shades with a great formula and some fantastic mattes which I’m all about. Although released for Holiday 2018 this palette has a Valentine’s Day feel and look. It comes in a large plastic compact with a clear lid and a red base. Inside you’ll find nine heart-shaped eyeshadows and two heart-shaped blushes. The colors, the packaging, it all screams V-Day to me. It’s quite cute but some might look at it and see “cheap” makeup. But don’t judge just yet as the formula is really quite good. You’ll get five silky matte eyeshadows all of which applied flawlessly on my eyes. There’s even a yummy rusty orange that might be ideal for my Sophie Turner look that I’m gagging to recreate. One thing about K-Beauty brands they always make some fantastic mattes that apply smoothly and flawlessly plus they accent eyes so brilliantly. I’m utterly addicted to Korean matte eyeshadow for this reason and that’s saying something considering what a sparkle h0r I am. This formula was powdery and had a certain density but the shades still applied and blended out flawlessly. There’s also one velvety satin with hints of shimmer and two sparkle topper shades. The two topper shades work best on top of shades as they run sheerer but you can wear them individually should you like for a hint of sparkle on a bare lid. All the shades were quite pigmented (aside from those two toppers) with excellent application and blending and no fall out. The blushes were soft and silky but not powdery. 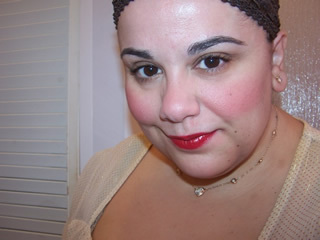 The left hand blush was a bit sheer for me but the right hand one added a nice pop of color to my cheeks (as seen on my cheeks in the photo below). All in all, the The Saem Love Me Multi Palette is one of those palettes that I find myself reaching for daily. These are just my type of shades and they don’t take a lot of know how to apply and to create looks with. It’s a fairly simple palette but it contains a host of great, warm shades. I’m at that age now I don’t need a lot of bells and whistles to get a nice eye look and this gets me exactly what I want without a ton of effort or know how! The Saem Love Me Multi Palette ($18.99) is a Holiday 2018 Palette that features two blushes and nine eyeshadows in matte, sparkle, and satin finishes. This palette is a fantastic pick if you like shades that accent eyes but aren’t into blending hundred of colors together to get a look. The shades work well together but also, individually to create some very nice, warm looks without a ton of effort. I thought the shadows were pigmented, silky, but not powdery and the blushes were equally silky. All in all, a great warm palette with essential shades you’ll reach for daily! Anyone who likes warm eyeshadows. Perfect for aging eyes as it accents without overpowering. Not available in the US (you’ll have to wait for airmail to get it). The Saem Love Me Multi Palette is an ideal palette for anyone who likes the simplicity when creating great eye looks! New Makeup & Beauty Picks from Korea You Need this Summer! Googlemeister reporting, bec I wondered if SK celebrates VD. Yes, they do, and these would have been most appropriate. The countries that do not are Muslim majority countries, and folks have been punished in some for celebrating their non-holiday. South Korean is heavily into V-day and just love in general. As they say, they are in love with the idea of being in love! A lot of Asian cultures are very involved in the novelty of love and romance 😉 Japan, Korean, Taiwan…! I think maybe you’re mistaking M’Asia as more than half the population is Muslim but some do celebrate Valentine’s Day or maybe even Indonesians (they aren’t terribly keen on V-day at all due to religious beliefs). agreed! they carry a lot of great brands! There shipping is a bit slowwww though! that’s my only issue with them!